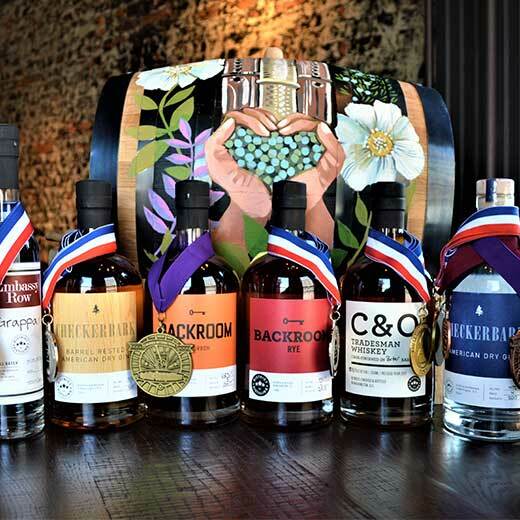 District Distilling Company is home to the ‘uniquely American spirit’. Our passion is to celebrate the American spirit and ingenuity by creating world class spirits in a uniquely American style. The result is a collection of award-winning spirits. Using German handmade copper pot and column stills, traditional techniques and wild foraged ingredients, our team proudly offers a suite of vodka, gin and whiskey products. Come take a tour and sample a selection, bring a bottle home, or enjoy a cocktail and a meal upstairs. Featuring District Distilling Co.’s products and spirits from leading craft distillers throughout the U.S., our seasoned bar staff compose thoughtful signature cocktails and deliver on the classics. We also offer local craft beers and a curated selection of wines. Guests are welcome to grab a stool, ask questions and glimpse through our observation door to see the spirits being made. We're honored that our spirits have been awarded medals by the American Distilling Institute (ADI), the Beverage Tasting Institute, theDenver International Spirits Competition, the New York International Spirits Competition, and the San Francisco World Spirits Competition. District Distilling was named DC Gin Distillery of the Year by the New York International Spirits Competition. In addition, we were also awarded the Eater 2016 Award for Design of the Year.